Sam Baber’s (Art and Design) startup, Atsá Foods LLC; Nesrine Majzoub’s (Sociology) startup, The Lens; and Cameron Wiese’s (Psychology) startup, PolyRents, all earned spots in the 2017 SLO HotHouse Summer Accelerator. Allie Blaising (Communication Studies) was one of 20 students in the United States selected as a research intern in the Human Computer Interaction Lab at Carnegie Mellon University last summer. Ian Fetters (English) won a prestigious fellowship to study H. P. Lovecraft at Brown University. A team of graphic communication students won Best Concept at the 2017 Phoenix Challenge Flexo Packaging Competition. 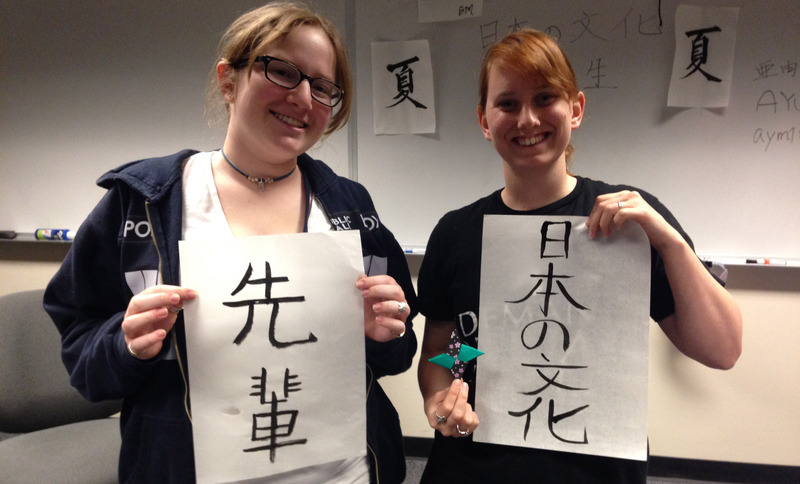 Sophie Rosales and Jensen Welton (History) won scholarships to study Chinese in Taiwan last summer through the education division of the Taipei Economic and Cultural Offices. Bianka Pantoja (Journalism) was selected as a fellow for the 2018 College Media Business and Advertising Managers (CMBAM) convention. For the fifth year in a row, the Cal Poly Mustang Band placed in the Adult Marching Band category at the Southwest Airlines Chinese New Year Parade in San Francisco. Gina Welisch (Philosophy) earned the Rise to the Occasion Award from the nonprofit group RISE (Respect Inspire Support Empower) for reaching more than 300 volunteer crisis-counseling hours. Cal Poly’s Mock Trial Team earned a bid to compete in the 2017 National Championship Tournament. Co-captain of the team, Zack Michaelson (Political Science) earned an All Regional Attorney Award at the Regional Competition. Maryam Quasto (Political Science) was Cal Poly’s 2017 representative to the Panetta Institute for Public Policy’s Congressional Internship Program. The Cal Poly Ethics Bowl Team, which includes 10 philosophy students, placed in the top four at the regional competition, which earned them an invitation to compete for the national championship for the second year in a row. Zulema Aleman (Psychology) received the Cal Poly President’s 2017 Student Diversity Award. Laura Krifka (Art and Design) won the David Whaley Artist-Teacher Grant. Emily Ryalls’ (Communication Studies) book, “The Culture of Mean: Representing Bullies and Victims in Popular Culture,” was published by Peter Lang Inc.
John Hampsey (English) was awarded a writer’s residency at the Heinrich Böll Cottage in Ireland. Jeremiah Hernandez (Ethnic Studies, Sociology) received a 2017 CSU Trustees’ Award for Outstanding Achievement. He will receive a $6,000 scholarship as the state’s Michael A. and Debe Lucki Scholar. 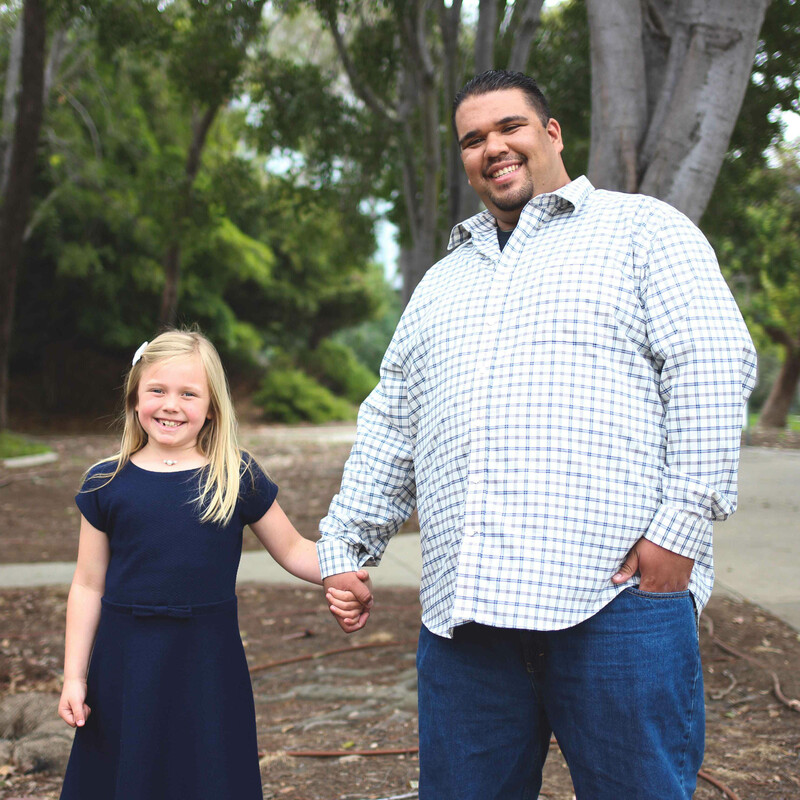 One student from Cal Poly receives a Trustees’ Award each year. Jason Peters (English) is part of an interdisciplinary team that was awarded a $140,000 grant from the U.S. Department of Agriculture’s National Institute of Food and Agriculture to pilot a curriculum that teaches students how to best communicate about sustainable agriculture. Chelsea Milbourne (English) received a 2018–19 American Council of Learned Societies Fellowship to support archival research. Jenell Navarro (Ethnic Studies) received the Cal Poly President’s 2017 Faculty Diversity Award. Matthew Hopper’s (History) book, “Slaves of One Master: Globalization and Slavery in Arabia in the Age of Empire,” was a finalist for the 2016 Frederick Douglass Book Prize. Sarah Bridger (History) was appointed to the Organization of American Historians’ Distinguished Lectureship Program. Mary Glick (Journalism) was selected as a fellow in Tow-Knight Center for Entrepreneurial Journalism’s Disruptive Journalism Educators program. Brady Teufel (Journalism) was named 2018 Journalism Educator of the Year in the Four-Year Division by the California Journalism and Media Affiliates. David Gillette (Liberal Arts and Engineering Studies) and architecture professor Thomas Fowler received a $30,000 Hearst Foundation Award for Scholarship in Education for their tunnel passage project. Scott Glysson (Music) was selected as a Conducting Fellow for the 2018 International Conductors Exchange Program with Kenya. Patrick Lin (Philosophy) received the 2016–17 Cal Poly Academic Senate Distinguished Scholarship Award. Elizabeth Lowham (Political Science) and Brian Kennelly (World Languages and Literatures) received the 2016–17 Cal Poly Academic Senate Distinguished Teaching Award. Michael Latner (Political Science) received a Voting Rights Kendall Fellowship from the Union of Concerned Scientists. 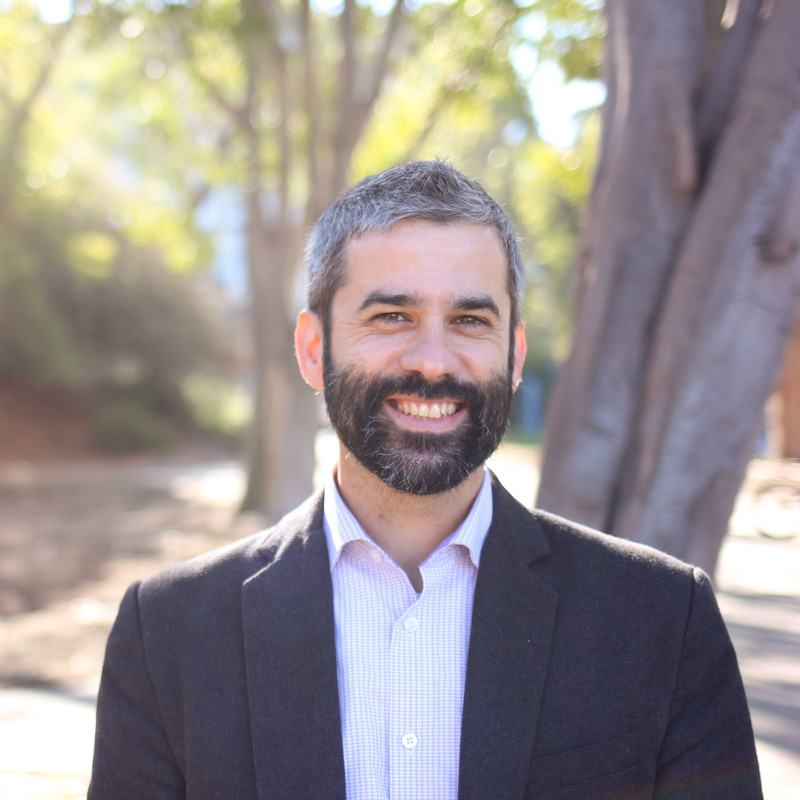 Ryan Alaniz’s (Social Sciences) book, “From Strangers to Neighbors: Post-Disaster Resettlement and Community Building in Honduras,” was published by University of Texas Press. 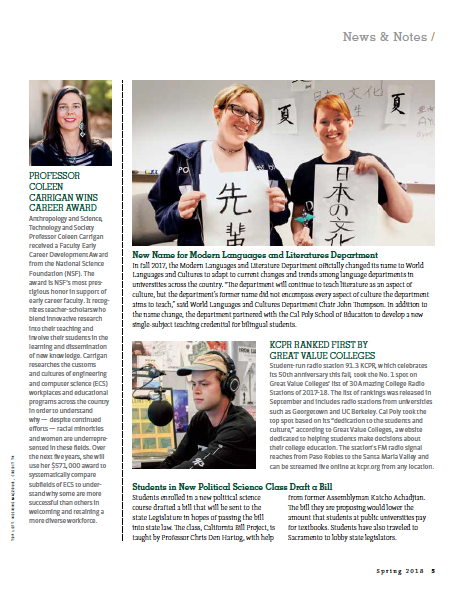 In fall 2017, the Modern Languages and Literature Department officially changed its name to World Languages and Cultures to adapt to current changes and trends among language departments in universities across the country. “The department will continue to teach literature as an aspect of culture, but the department’s former name did not encompass every aspect of culture the department aims to teach,” said World Languages and Cultures Department Chair John Thompson. In addition to the name change, the department partnered with Cal Poly's School of Education to develop a new single-subject teaching credential for bilingual students. 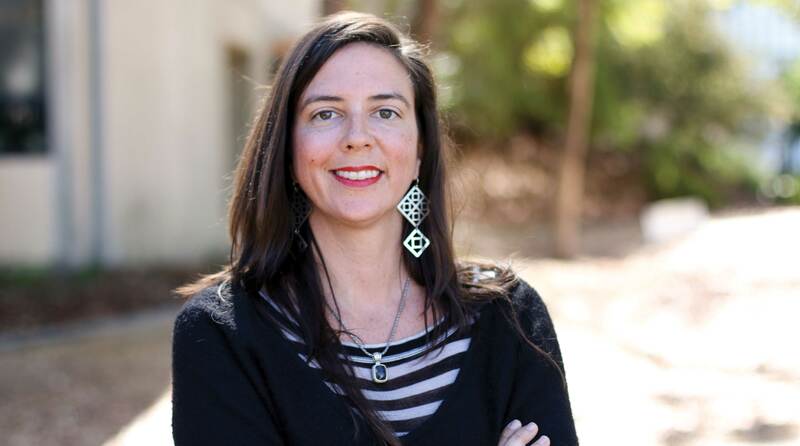 Anthropology and Science, Technology and Society Professor Coleen Carrigan received a Faculty Early Career Development Award from the National Science Foundation (NSF). The award is NSF’s most prestigious honor in support of early career faculty. It recognizes teacher-scholars who blend innovative research into their teaching and involve their students in the learning and dissemination of new knowledge. Carrigan researches the customs and cultures of engineering and computer science (ECS) workplaces and educational programs across the country in order to understand why — despite continued efforts — racial minorities and women are underrepresented in these fields. Over the next five years, she will use her $571,000 award to systematically compare subfields of ECS to understand why some are more successful than others in welcoming and retaining a more diverse workforce. 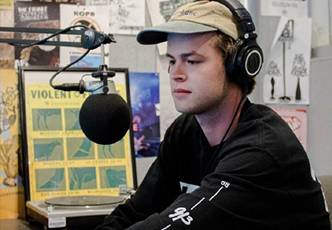 Student-run radio station 91.3 KCPR, which celebrates its 50th anniversary this fall, took the No. 1 spot on Great Value Colleges’ list of 30 Amazing College Radio Stations of 2017-18. The list of rankings was released in September and includes radio stations from universities such as Georgetown and UC Berkeley. Cal Poly took the top spot based on its “dedication to the students and culture,” according to Great Value Colleges, a website dedicated to helping students make decisions about their college education. The station’s FM radio signal reaches from Paso Robles to the Santa Maria Valley and can be streamed live online at kcpr.org from any location. Students enrolled in a new political science course drafted a bill that was introduced in the California Legislature by Assemblyman Jordan Cunningham. The class, California Bill Project, is taught by Professor Chris Den Hartog, with help from former Assemblyman Katcho Achadjian. The bill, AB 2385, would lower the amount that students at public universities pay for textbooks. In May, students traveled to Sacramento to testify at a hearing on the bill. Download a pdf of this article or a pdf of the full IMPACT magazine.